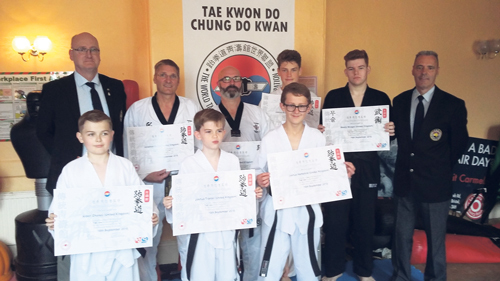 SEVEN members of a Staple Hill gym are celebrating success after taking demanding taekwondo black belt grading exams. They were put through their paces at the Elite Chung Do Kwan Gym, based in the function rooms above the Portcullis pub. Visiting examiner, Grand Master Mark Iles 9th Dan, a former World Chung Do Kwan champion, and Grand Master Andy Davies 9th Dan, a former nine-time British champion and European silver medal winner, were on hand to conduct the exam. Candidates underwent a fitness test, performance of basics, multi-directional kicking, patterns, step-sparring, free sparring against single and multiple opponents, a knowledge and meanings test, weapons drills and board breaking in addition to having to submit a six-page written thesis and undergo an interview. Andy Davies said: "The exam tested students in all aspects of their level of skills that they had acquired over a number of years in what was a very physically demanding environment."